Workers at the Market Basket supermarket chain just successfully undertook a high-risk job action with potentially historic repercussions. But this was more than just a fight for leadership control. It was also a story about boomers standing up for workplace values. The series of events, which resulted in the sale of the company's 71 Massachusetts and New Hampshire grocery stores, offers hope that boomers may reclaim their generational legacy and bring it into the workplace. 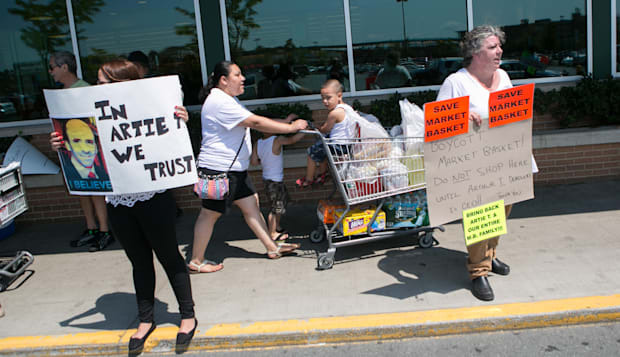 The back story: Two months ago, Market Basket's Board of Directors fired company president, Arthur T. DeMoulas, the latest scene in a decades-long drama between warring factions of the wealthy DeMoulas family, Market Basket's owners. At the center of the bitter feud: cousins Arthur T. and Arthur S. DeMoulas. Arthur T. and his family owned 49 percent of the privately-held company; Arthur S. and his side owned 51 percent. Arthur T. ran Market Basket with a straightforward and progressive management philosophy: treat its 25,000 employees (and customers) with respect and attention; promote from within; provide great pay and retirement benefits and continually invest in your staff. As a result, he developed an extraordinarily devoted workforce of people who grew up at the company and remained for decades and took great pride in making the stores so successful. Over time, though, Arthur T.'s pension programs and above-market salaries were criticized by the board, who felt such generosity depressed shareholder dividends. On June 23, the board ultimately voted to remove Arthur T. as president. That's when the chain's employees - many of them boomers - rose up in revolt. Some went on strike; others played key roles in protests including rallies attended by thousands. Customers stopped shopping at Market Basket and suppliers could no longer deliver new products. In short, the company came to a near halt, with business down by 90 percent and losses of an estimated 10 million dollars a day. Market Basket's employees - and the thousands of customers who joined their movement - didn't want to bring down the chain. They just wanted Arthur T. back in charge. This was an unprecedented twist to the history of job actions in America, typically initiated by employees seeking more money and better working conditions. The fact that the Market Basket actions were led by staffers whose careers with the company spanned decades adds an unusual, and I think inspiring, twist. The Market Basket uprising wasn't a protest driven by youthful optimism, but rather a reuniting of idealism with a generation that seemed long ago to have moved away from its activist roots. Nearly all of the stores' senior managers signed a pledge that they wouldn't work for anyone other than Arthur T. Grocery supervisor Tom Gordon (whose Market Basket career has spanned 39 years); facilities and operations supervisor Steve Paulenka (a 40-year vet) and Tom Trainor, a distribution supervisor (who has worked at Market Basket for 41 years) were among the early leaders of the protest and were fired by the co-CEOs retained by the board to replace Arthur T.
The pictures taken at the Market Basket rallies and as part of the reporting of this story showed a broad range of activists, many of whom seem closer to retirement age than to their youth. Market Basket's activist boomers, I believe, helped reinvigorate a needed debate about corporate stewardship and whether management's primary financial path should be a focus on short-term dividends to shareholders or on additional investments in growth, employee pay and benefits to develop a stable and loyal workforce. They also brought back the concept of corporate responsibility as a critical part of the conversation about business success. For decades, corporate responsibility has been discredited by a narrow focus on shareholder value as the marker of a company's worth. The generation that played such an important role in the social movements of the '60s and early '70s can also take pride in one additional aspect of their high-risk job action: They prevailed. Two months after Arthur T. was fired and the protests and boycotts began, the former president reached a deal with the Arthur S. interests to purchase their majority share and retake his place as CEO. The road ahead, however, is long. After a summer of empty shelves and few customers, Market Basket must immediately swing into rebuilding mode. In light of its employee and customer-focused principles, the company is unlikely to turn to traditional means of cost-cutting by eliminating staff. I'm optimistic. I believe the employees who can't wait to get back to work and demonstrate their loyalty will do everything they can to get Market Basket back to normal. I also think they'll be followed by devoted customers, anxious to return to stores famous for their low prices and wide variety on the shelves. These combined forces have the capacity to deliver a storybook ending with a powerful lesson: Boomers had it right all those years ago. You can stand for something and make a difference. Many boomers, however, stopped standing when they entered the world of work. They accepted the status quo and stopped asking the hard questions. Maybe now they'll be inspired by their Market Basket brethren. Perhaps they'll start asking hard questions about their own workplaces and rethink how their companies value employees. If boomers start doing that, they just might be able to finally reclaim their legacy and create a better workplace for everyone. Lauren Stiller Rikleen is the author of the recently released book, You Raised Us – Now Work With Us: Millennials, Career Success, and Building Strong Workplace Teams. She is the president of the Rikleen Institute for Strategic Leadership and the Executive-in-Residence at the Boston College Center for Work & Family.